As many of you loyal blog readers know, we hail from Montgomery County, Maryland and for the first few years of the boys’ lives, one of the greatest pleasures we had was taking them to Lake Needwood. Well, recently the northeast was hit with a phenomenal amount of rain and the natural earthen dam at Lake Needwood sprung some leaks and virtually flooded the entire park area. Water flooded the pavilions, raised throughout the hiking trails and covered playgrounds. Now, they are having to drain the lake. Though, we agree with the news reports that “safety is more important than recreation,” it really is tough for us to see photos of our old “stomping grounds” in such a sad state. 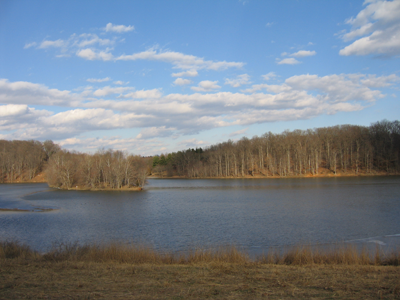 Many of our most cherished memories are of Lake Needwood. You can view some of the old blog posts. Moving to Florida was a somewhat difficult decision and friends and family would ask us if we were worried about hurricanes and such. Fortunately, our first year here, we have been very lucky in that the weather has been awesome. On the other hand, it has been difficult seeing that our old home town is struggling with severe rains. So, we just relish the memories and continue to make more happy times. That’s interesting—I moved from Florida (west palm area) to Montgomery County! Did you adopt your pug(s) in MoCo? And if so, where? I’m hoping to adopt in about a year when I move into a condo.